Beautiful, beautiful things you've added. Your home looks so lovely and peaceful. It looks lovely! I bet there's hardwood beneath that lino for sure! Making a place into a home IS a long process. I think that found objects and handmade items certainly add the right character and sentiment. Your apartment looks absolutely lovely to me. Are those his and hers shirts on the doorknobs? Lovely! Thank you! We didn't bother to tidy up before these pictures, because I don't care for staged photos! Erica, I think those are both Geoff's shirts but my Lena Corwin / Mociun tote! I had just washed it so it's all wrinkled. Oh, it looks so nice and cozy! I'm getting to the point where everything in my home should have a story or it needs to be donated. There are, of course, a few exceptions for some essentials...I mean why should a toothbrush have a story? If it does, it's been around too long. LOVE the book stacks. I always forget to do that. 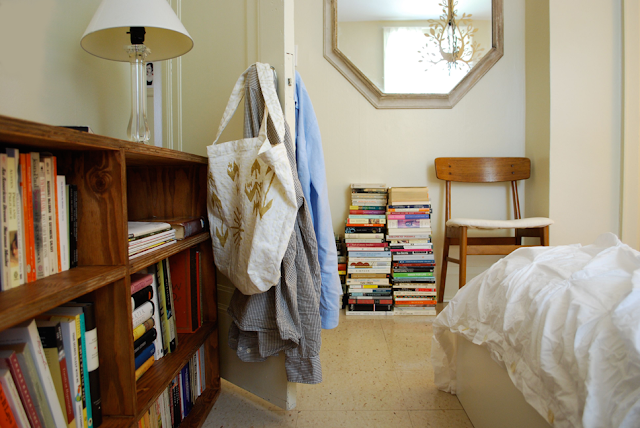 one of my favorite things in a home is books & books & books, so over-flowing, & i'm loving the books against the wall! lovely additions. i need a bookshelf just like that! Oh! I wish I had someone to build me furniture! Lucky ducks! 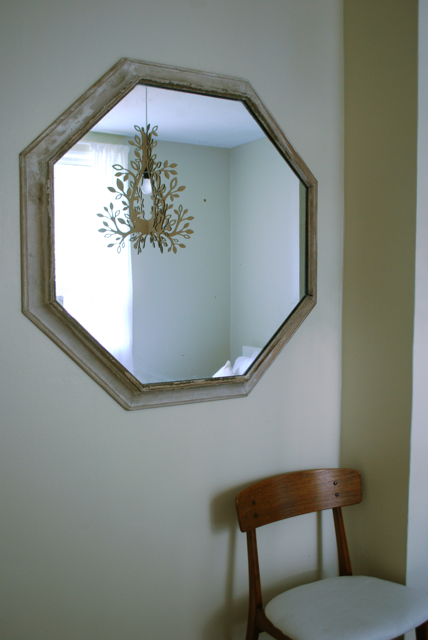 I love that photo of your chandelier reflected in the mirror! Super dreamy! i love that mirror and would love to know more about the chandelier and the color name of that creamy white on the walls. Thanks, everyone! We actually shelved the stacks of books for now although I do quite like they way they looked on the floor. And yes, it is very nice to have someone to build stuff for us! It was an easy job and Geoff's dad has all the fancy equipment -- Geoff was supposed to help but his dad decided one day to just do it! Nancy, that chandelier is from Urban Outfitters! Yikes! I bought it on clearance in May. Parts of it were broken but nothing a little wood glue couldn't fix. As for the wall colour, I don't know! We haven't repainted. It's just an off-white, probably whatever dregs of paint the contractor had lying around, haha. It looks lovely. And the mirror--it makes me think of how so many things involved at least a facade of luxury--that even flying used to be something you dressed up to do. So different from today!